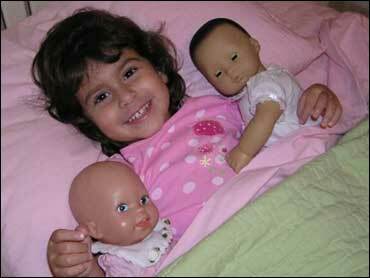 Photo: Makayla Sitton, 6, murdered on Thanksgiving. JUPITER, Fla. (CBS/AP) A Thanksgiving dinner turned into a violent horror show as three women and a child in bed were shot to death during a family gathering, say Florida police, and now Paul Michael Merhige, the man police say is responsible, is on the run. Police said 17 relatives were in the house when Paul Michael Merhige, 35, shot to death his twin sisters Carla and Lisa Merhige, 33, aunt Raymonde Joseph, 76, and 6-year-old cousin Makayla Sitton. The shootings were reported around 10 p.m. Thursday in Jupiter, a small, well-off beach town about 90 miles north of Miami that is best known as a home to celebrities including Michael Jordan and Burt Reynolds. Jupiter Police Sgt. Scott Pascarella said officers were looking for Paul Merhige, of Miami, who has no prior criminal record. Authorities said a fifth victim, Paul Merhige's brother-in-law Patrick McKnight, was being treated at a hospital. His condition was not available. Police across South Florida and the U.S. Marshals Service were searching for Paul Merhige. Pascarella said Paul Merhige is believed to be driving a blue 2007 4-door Toyota Camry with Florida license plate W42 7JT. Pascarella said police received a 911 call from a neighbor shortly after 10 p.m. Police then received a second 911 call from someone within the home. Pascarella says the shootings took place inside the house. "What led to this incident, we're not quite sure," said Pascarella. "It did not appear there was any altercation prior to this shooting." Police said the home was owned by Jim Sitton, a photojournalist for WPTV-TV and father of the little girl killed. Sitton told WPTV his daughter was in bed when she was shot. He was at the party at the time of the shooting but was not wounded. Yellow crime scene tape was stretched around Sitton's salmon-colored house, located in a well-kept subdivision of stucco homes. Several cars were parked in the driveway, and a crime scene van sat in front. Sitton told local media that his daughter was supposed to perform Friday in a holiday production of "The Nutcracker." The relationship between Sitton and Paul Merhige was unclear, police said. Phone calls to a number listed for Paul Merhige were not answered. A phone call to Sitton was also not returned. Neighbors in the Palm Beach County community were shocked. "Our kids walk the streets by themselves," said 67-year-old Nicole Kemp, who did not know any of the victims. "I thought it was the safest place to live. I guess it doesn't matter, if there's a maniac here." It's unclear where the adult victims lived. Carla Merhige was a real estate agent in Miami, said a co-worker. "She was a wonderful agent," said Joanna Sherman, a manager at Coldwell Banker Residential real estate. "She was very active in the community and in charities. She was just a genuine, beautiful individual. She always had a smile for everybody."